Backpacking should never be attempted without coffee. The best part of waking up in the backcountry is the glorious smell of the wilderness around you and the aroma of a fresh pot of coffee. A crisp morning in the wild, light dew on your tent, and a hot cup of coffee is the only way to start your day. Mornings on the trail are magical and coffee adds a little something to look forward to before hitting the trail. Whether you are thru-hiking the Appalachian Trail or on a week-long leg of the Pacific Crest Trail. A cup of coffee in the morning is an integral part of the success of any backpacking trip. Coffee today has become a staple in the everyday diet with numerous methods to brew it and styles of coffee to choose from. Backpacking coffee is no different except for the natural beauty that surrounds you. While it involves little to no equipment, cowboy coffee is often made quickly which ends up being a disaster. Cowboy coffee doesn’t have to be terrible. You’re using the same equipment and ingredients that it takes to craft any other cup of coffee. The trick is taking your time and doing it carefully. Side Note: If you have a clean sock, bandana, or thin piece of cloth you can use that to filter the coffee grounds as you pour the coffee into your cup. The Aeropress coffee maker is a blend of the French press, pneumatic press, and a pour over coffee maker. The cup of coffee that it makes is one of the best tasting cups around. It uses a high-pressure press that spits out a shot of espresso, rather than a cup of coffee. It evenly extracts the coffee from each and every ground. Unlike drip coffee makers where the coffee grounds on the edges of the filter are neglected. It weighs in at just under eight ounces and is roughly the size of a small water bottle. The biggest drawback is that it comes in four pieces and if you lose one you’re screwed. Side Note: The Aeropress leaves the coffee grounds compact and easy to clean up. The French Press makes a tremendous cup of coffee, some would say the best. There are a variety of french press camping options. They are small, lightweight, the size of a small water bottle, and most importantly nearly indestructible. The main drawback for backpackers is making room for the size and weight of a french press. However, today there are models that weigh under 8 ounces. For those who have a deep love and admiration for the best cup of coffee, weight is a non-issue. Side Note: For the best tasting cup, pour just enough boiling water over the grounds and let the gasses bubble up. After 30 seconds, pour the rest of the water into the french press and patiently wait. Before you roll your eyes and exit this tab, hear us out. We are 100% aware of the fact that instant coffee conjures up images and flavor of that terrible cup of diner coffee and for good reason. The first iteration of instant coffee was awful, barely drinkable. Instant coffee has come a long way from the days of the standard, run of the mill coffee crystals. There is an actual coffee flavor and taste in the new and improved instant coffee packs. For the ultralight backpacker, instant coffee is the go-to. There are times when you forget that you are drinking coffee made from small crystals. Side Note: Pour just enough water into the instant coffee to make it a paste. Then, pour the rest of the water into the paste, give it a light stir and enjoy. Drip cones have been around forever and with the collapsible technology applied they are ultralight and compact. This method is simple to use, easy to clean and make a decent cup of coffee. Backpacking drip cones are made of metal and plastic and weigh only a few ounces. They fold or collapse down and are super easy to use and easily added to any backpacking gear set. Side Note: A general rule of thumb is to use 2 tablespoons of coffee for every 6 ounces. Any more than that and you’re wasting precious backpacking coffee grounds. Not everyone likes their coffee black. 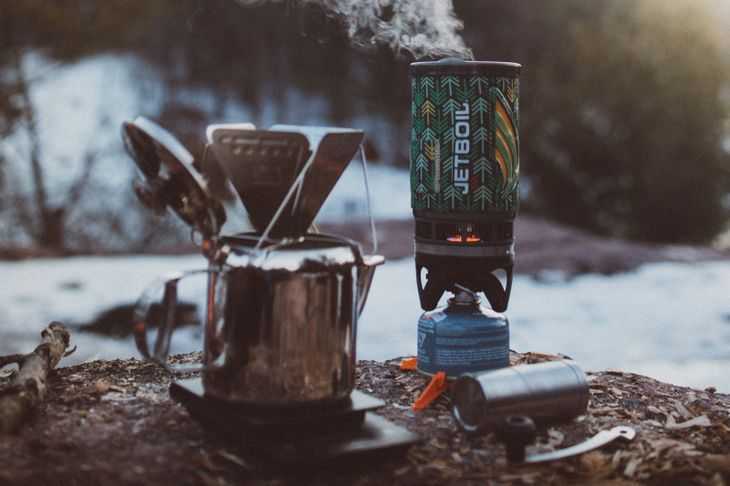 Just because you’re in the backcountry doesn’t mean that you don’t get to enjoy the luxury of a flavorful cup of joe. Collagen protein powder has blown up in the last couple years as a dietary supplement. The reason it made the list is the high number of health benefits associated with regular consumption. The protein powder is made from ground up connective tissues of cows and fish. It has 20 grams of protein per scoop (source), it’s flavorless, and it completely dissolves into a hot beverage like coffee. According to Dr. Axe, consuming collagen protein improves the health of your skin, reduces joint pain, boosts metabolism, boosts, energy output, and improves cardiovascular health. All of these are critical considerations on any backpacking trip and any little place to find a minor improvement is a welcomed addition to your backpacking gear set. Some people can’t stand the thought of a bitter, bland, and plain black cup of coffee. Milk or some sort of creamer is a popular addition to coffee. While carrying around milk or creamer isn’t possible on a backpacking trip, the next best thing is powdered milk. Dried or powdered milk is milk without the water. Most of the nutrients remain except for vitamin C, thiamin, and B12 (source). While the taste isn’t exactly the same, it does add a familiar flavor to your morning cup of backpacking coffee. Even with all the negative health benefits that have come to light in recent years about the negative health benefits of sugar. Life is all about moderation and a little bit won’t kill you. The sweet taste of sugar in coffee is a nice treat in the morning. Sugar is lightweight and easy to add to your backpack. Just keep in mind that in rainy conditions wet sugar will transform into a sticky mess. When brewing fresh coffee in the outdoors you are going to have coffee grounds and/or packages to dispose of properly. There is a debate on exactly how to handle used coffee grounds. Some people believe that scattering them carefully in the foliage is an acceptable way to dispose of them. While other people vehemently argue that you pack out each and every piece of garbage you produce. The Leave No Trace guidelines clearly state that you dispose of waste properly. Ideally, packing all your waste out is the ultimate goal. There’s something special about field brewing a pot of coffee. Waking up in the morning with a hot mug between both of your hands and enjoying that warm feeling between your hands while the sun is rising. Coffee while backpacking doesn’t have to be a bland cup of instant coffee, it can taste just like the coffee that you enjoy at home. Coffee and backpacking are a match made in heaven. Keep calm and backpack on.